A Tradition of Excellence… It seems that in these times when “Cajun” is the “in” thing, it is difficult to sort through all the imitations, the fakes, and the exploitations of Cajun culture. There is however one band, The Cajun Tradition, who has been around long before Cajun was popular outside of Acadiana. The Cajun Tradition has upheld the tradition of excellent Cajun musicianship and music that is most evident in their performances. The group got it’s start playing local dance halls, night clubs, and famous Cajun restaurants including Randol’s, Mulate’s, and Belizaire’s. Later travels logged performances at the 1984 World’s Fair in New Orleans and the 1987 Cajun Music Festival at Loretta Lynn’s Dude Ranch in Hurricane Mills, TN. 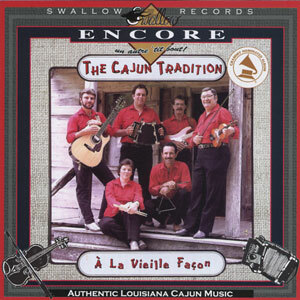 Among much local recognition, in 1987 the group was awarded the title “Musicien du Bal” in the Acadiana music scene and national recognition from this 1988 album release, “a la vieille façon,” earned the group a nomination for Best Traditional Folk Recording for the 1989 Grammy Awards. Jamie Berzas from Mamou, Louisiana founded the band in 1979 and is the band leader, accordion player, vocalist, and also plays drums and guitar on occasion. Mark Young from Mamou co-founded the group and is the lead vocalist, rhythm guitarist, and also plays accordion, drums, and fiddle. Lee Manuel from Mamou joined the group in 1984, and played the fiddle, guitar, and drums. Mr. Manuel played Cajun fiddle for 50 years, and was a Cajun music disc jockey for KVPI Radio in Ville Platte. He passed away April 29, 1991 after a long illness. Madeline Berzas from Mamou is married to Jamie and plays drums and triangle. George McGee from Basile plays triangle, spoons, and guitar. Glenn “Chic” Richard from Carencro plays bass guitar, accordion, and rhythm guitar.